Every workplace can prove hazardous. Knowing what to do and who to tell can sometimes mean the difference between life and death. Do you know how to respond in the event of emergency, or how to communicate the presence of a hazard in the workplace quickly and efficiently? 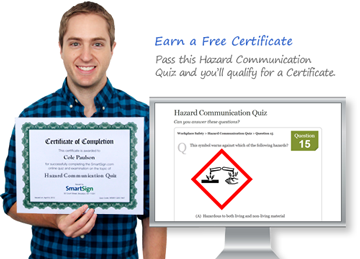 Make it easy for you and your coworkers to stay safe with these fun and free quizzes, packed with information about hazard communication protocol and regulations. Teaching yourself the tricks of the trade when it comes to hazard communication is much more accessible than reading about regulations in dense articles. That’s why we’ve put together these quizzes: to make it easy to understand how to respond to the presence of a hazard in order to keep you and your coworkers safe. Through multiple choice and true/false questions, these quizzes will test your knowledge about hazard communication so you’ll know exactly how to respond and communicate effectively when encountering a workplace hazard. Think you're already a hazard communication expert? Chemical Hazard signs and labels are some of the best ways to alert your employees and visitors about the potential hazards at the workplace. These designs also help reinforce safe handling procedures. In fact, chemical hazard signs and labels are your last defense against chemical accidents. • Through which path are toxic chemicals able to enter your body? • What does the acronym SDS stand for? • When must your employer retrain you? • What must your training include to protect you from exposure to hazardous chemicals? • The maintenance department in your plant found that Lysol® Toilet Bowl Cleaner does a great job for polishing the outside of storage tanks. Your supervisor says that there is no need to train you because the material is a common consumer cleaning product, and you will be using it for its intended use. Is this the proper procedure?